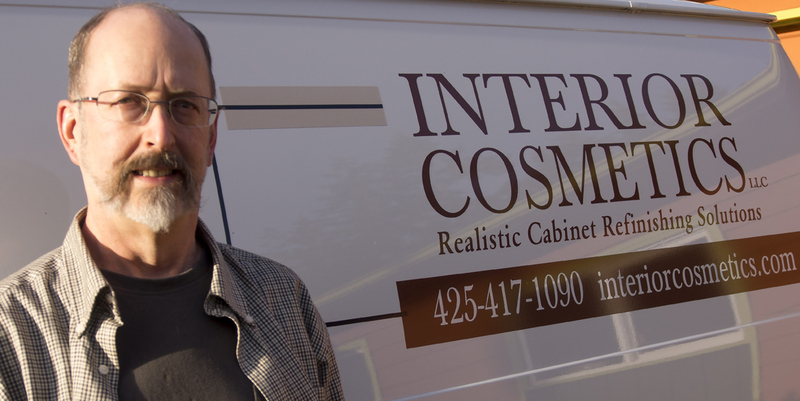 Interior Cosmetics is an artisan company serving the Puget Sound area, owned and run by Dave Bishop. With an impeccable reputation, Dave has been finishing fine cabinetry since 1974, and uses the best quality commercial grade finishing products available. Unlike some contractors who take many jobs at once and rely on laborers with inconsistent skills, Interior Cosmetics prefers to work with one customer at a time. You receive the benefit of having the full attention of the craftsman for your project. Interior Cosmetics, LLC is a member of the Master Builders Association of King & Snohomish Counties, the Better Business Bureau, and is a fully licensed, bonded and insured General Contractor. Your satisfaction is guaranteed. Dave Bishop, Owner/Designer of Interior Cosmetics will help you be proud of your kitchen again! Let Interior Cosmetics restore your wood cabinets to their original beauty—or beyond!